Referencing: The basics - Where to store my references? Where to store my references? Where should I store my references? Remember to note down the necessary components you need to reference a particular item as you go. Imagine that you have used the item below for your assignment. When you recorded the details about this item, you forgot an essential component that you need for your reference. Answer the questions below to find out what's missing. What type of item is this? Which essential component is missing from the reference? Visit Google Scholar and try to find the missing reference details. Which of the below is correct? Imagine that you have used a quotation from the book below in your essay. You have forgotten to record all the essential reference details. Answer the questions below to construct a complete reference. What essential components are missing? 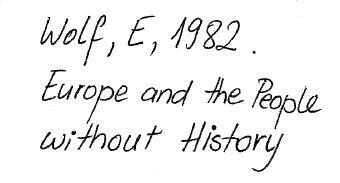 Go to the Catalogue, type in: europe and people without history. From your results list, find the correct item.What is the missing information? Reference management tools, such as RefWorks, are specialised tools for storing and managing your references. This flow chart will help you decide whether you need a Reference Management tool. Find out more about reference management tools.